* Kaftan length: --- Please Select --- 49"	53"	57"
A beautiful Fleece kaftan in Sandy-Beige. 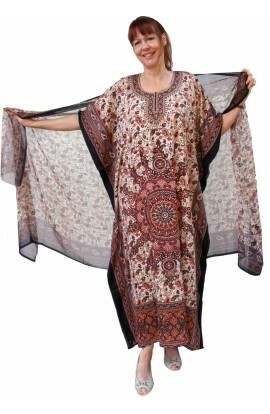 This warm fleecy kaftan made in excellent quality fabric is available in three lovely colours. Suitable for men or women. It is free-sized and very loose-fitting, and suitable for UK sizes 14 to 30. Available in a choice of length to suit your height, 49,53,or 57"
Also available as a BESPOKE version, in other sizes both smaller and larger, and in a length to suit your needs.